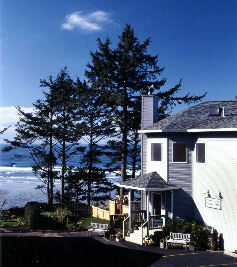 Newport Oregon bed and breakfast, the Tyee Lodge Oceanfront Inn. We boast a breathtaking setting, true to your image of the Oregon Coast, with windswept trees, waves crashing on headlands, and flat sandy beaches! Northwest decor and colors enhance the oceanfront view from every room, all with a gas fireplace. From our secluded half acre of gardens, an easy trail leads to tide pools and miles of beach. Walk to Yaquina Head Lighthouse. Newport attractions are a five minute drive away. Member of AAA ***. Noted in Best Places to Kiss, Fodor’s, Northwest Best Places,Frommer’s, and Karen Brown.